The top three US airlines have all caved in to Chinese pressure and dropped all mention of Taiwan from its booking sites. The Chinese government has warned of sanctions, fines or the inability to do business in China if airlines didn't remove any mention of Taiwan from airlines sites around the world. It had set a deadline of today 25th July for all airlines to comply or risk not being able to fly to China. The Taiwan issue is a sensitive one, China see's it as a wayward state or province of China, whilst others view Taiwan as a self-governing independent state, a country in its own right. Earlier this year, Chinese authorities demanded that airlines in particular, not refer to Taiwan as a non-Chinese territory on their websites. Many airlines have complied without question, including British Airways which now says it flies to Taipei, Taiwan - China, which has been causing confusion for some British citizens as no visa is needed to enter Taiwan but a visa is needed to visit China. 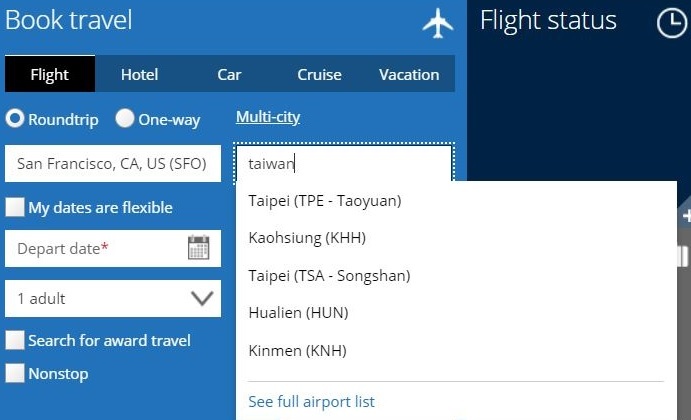 Some airlines have removed Taiwan completely, listing Taipei as China. Other airlines, including the big three US carriers now just list flights going to Taipei. Taiwan’s Foreign Ministry condemned most strongly the Chinese government’s use of political and financial power to “crudely and unreasonably interfere with private commercial activity and international companies’ operations”.